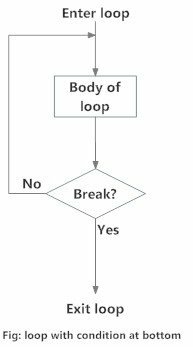 In this article, you'll learn to control the execution of a loop by using loop control statements like break and continue. Python programming offers two kinds of loop, the for loop and the while loop. 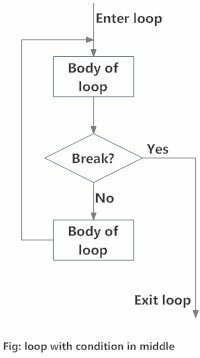 Using these loops along with loop control statements like break and continue, we can create various forms of loop. We can create an infinite loop using while statement. If the condition of while loop is always True, we get an infinite loop. This is a normal while loop without break statements. 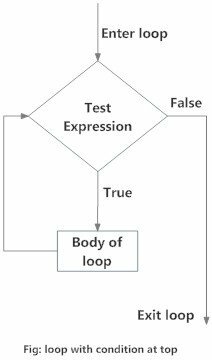 The condition of the while loop is at the top and the loop terminates when this condition is False. This kind of loop can be implemented using an infinite loop along with a conditional break in between the body of the loop. # Program to illustrate a loop with condition in the middle. That is not a vowel. Try again! This kind of loop ensures that the body of the loop is executed at least once. It can be implemented using an infinite loop along with a conditional break at the end. This is similar to the do...while loop in C.